Gluten Free Rainbow Cookies | Great gluten free recipes for every occasion. It’s (finally!) Christmas Cookie Baking Season! I take this time of year very seriously, as I am in love with just every single thing about baking cookies. There’s something for everyone, and if I ever meet a person who swears that they just don’t like cookies at all, I will make it my business to find the cookie they do like. 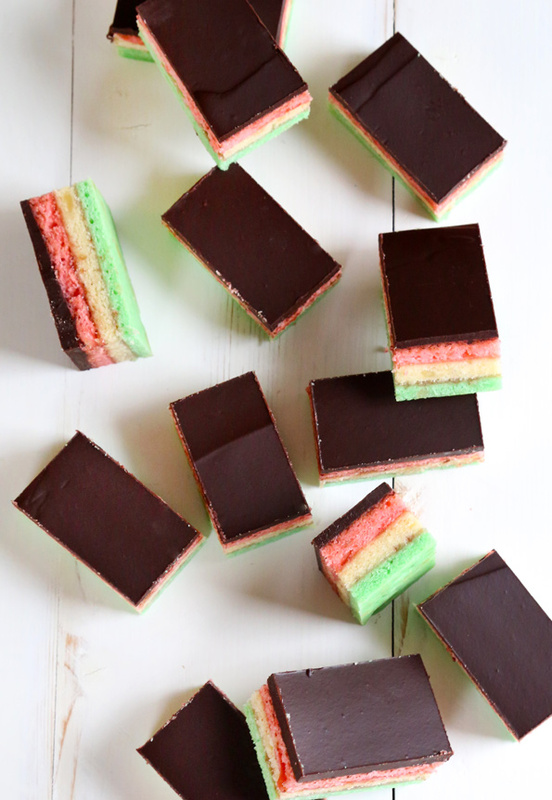 These gluten free rainbow cookies are the Cadillac of Italian bakery cookies. They’re the ones I always looked for first in the bakery box. Simply put, they’re my favorite—and this sweet chocolate-covered almond cake treat is at least as good as the gluten-filled bakery cookies of my childhood. All 3 of my children love them, too, but that might at least be partly because they love a good competition and, well, they know they’ll have to fight me for that last cookie. I first posted a recipe for rainbow cookies on the blog over 3 years ago (that recipe now redirects to this one). Over the years, as I’ve learned more about gluten free flours and blends, I’ve tried reworking it. I thought I could make it better—even though it was already perfect. Well you can guess how that turned out. I just kept coming right back to the original recipe I created way back in 2010, so I’ve contented myself here with better pictures including plenty of (admittedly totally unnecessary) step-by-step photos, and better instructions. And you probably already know this since you’re most likely not me as a small child, but all 3 layers taste exactly the same. They’re just different colors. Okay part of me still thinks they taste different in the most subtle, but incredibly important, way. Still you should of course feel free to make three “natural” layers and skip the food colorings altogether if you’re against that sort of thing. We’ve got just over 3 weeks until Christmas Day, and I for one plan to make gluten free cookie baking a major part of my life. Stay tuned for more cookies (always more cookies!) and keep that oven warm for me! Make the cookie dough. In the bowl of a stand mixer fitted with the paddle attachment (or a large bowl with a hand mixer), cream the almond paste and butter until well-combined. There may be some remaining small clumps in the almond paste, which is fine. Add the sugar and eggs, beating to combine well after each addition. The batter should be thick. Add the flour, xanthan gum and kosher salt, and mix until the dough comes together and is smooth. Divide the dough into three equal parts (each about 500 grams). Add the green food coloring to one part, and mix to combine. Add the red food coloring to another part, and mix to combine. Divide the 3 parts of dough among the three prepared pans. Stretch and press the dough into an even layer in each pan, using wet fingers and a wet spatula. The dough will be sticky. You know – I’ve never had these but they intrigue me….. so now I must make them. I love almond anything…. Also – do we have a GF spritz recipe? My daughter proclaimed they are her favy, fav, favorite last week – who knew? Went to Sam’s club today and they had Krusteaz all purpose gluten free flour. Have you tried it ??? Bought the gf brownie mix by them and the grandkids wolfed them down before I got to try them. But they all love chocolate and all eight of them were here. The price was about $10 for 5 pounds. I’ve never heard of it, Carole. I just looked it up, and the ingredients in the all purpose GF flour are: whole grain sorghum, brown rice flour, whole grain millet, white rice flour, modified tapioca starch, quinoa and xanthan gum. There’s no way a blend with all those heavy flours would work in my recipes, I’m afraid. Sorry! I think the sorghum, millet and quinoa would give an odd flavor, too. Better Batter is the best I have found, and if you buy directly from them, (not Amazon) you can often find great sales. Oh well , guess I’ll stick with Better Batter. But thank you for answering me. My family loves your recipes so much !!!!! When is the new cookbook going to be available ??? The bread book is the best . My sister bought me some and I used it last week in a cake recipe because I was out of superfine white rice flour to make my own. It was just ok. It was definitely heavier and drier. I’ll stick with Nicole’s flour blends from the Bakes Bread book :) The Krusteaz would probably be ok for pancakes or basic brownie recipes… I’ll have to do something to use it up, although I wouldn’t buy it again! Thanks for letting us know your experience, Jen! That blend sounds like it’s suffering from trying to be all things to all people—high in whole grains, but still “all purpose.” You really can’t be both! Hi, Dana! These cookies are definitely up to the challenge! These must be a southern Italian thing, because I have never seen them. (most of the Italian population here is northern, and we don’t really have an Italian bakery- don’t know why when there are so many of us) but I love, love all things almond and marzipan, so I must make these as soon as possible and hide them from my family. 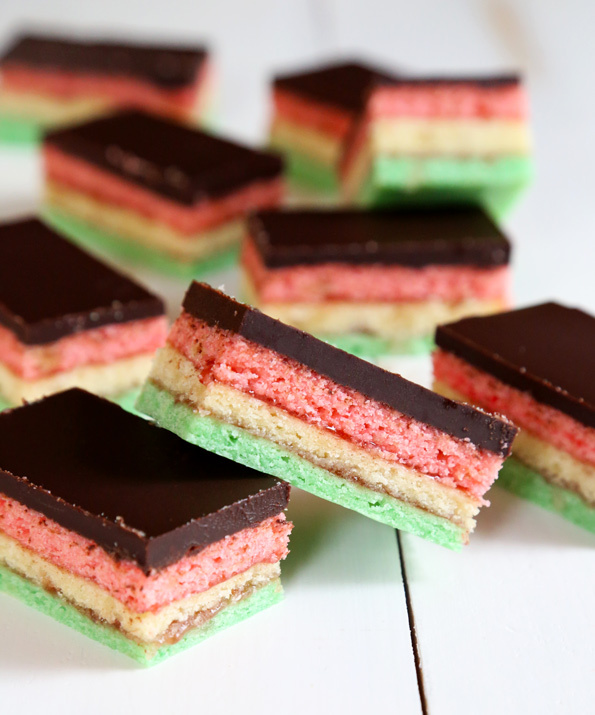 They look like spumoni… mmmm….. Thank you!! I think they’re mostly an Italian American thing. I grew up in NY and these were one of my favorites as a kid. I want to make this, but does the cookies get very hard? I’m afraid I don’t understand your question, Profran. These cookies have the exact same taste and texture as the kind you buy in the bakery. I noticed those edges too – almost tried to grab one through my screen….